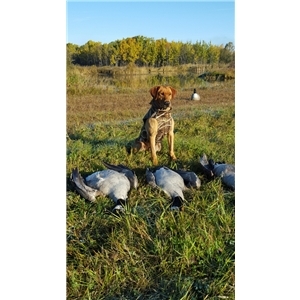 Yellow and fox red pups sired by our "North Country Crockett MH" who earned his MH as a 2 year old. Crockett was bred to our "Millie" (daughter of MH/ QAA - Open Win - Highvoltage Captain's Mark V) and our "Quinn" (daughter of GMHR Ramer's Instant Cash Machine MH). 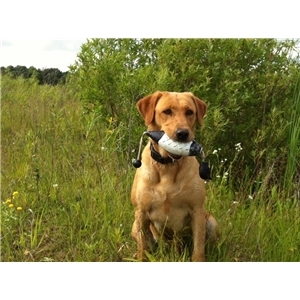 Both our girls are talented gun dogs and have produced trainable, talented pups when bred to Crockett in the past. Pups were born July 4th and will be 8 weeks 8/29. We have a couple boys available from each litter. All parents have their genetic testing in order - OFA/CERF/EIC/PRA/CNM> Please call for details on your next hunting partner.